Following in the podsteps of the Maid RPGcast and Crystalis D&Dcast before it, I humbly present to you the Final Fantasy RPGcast, GameCola’s third foray into the realm of podcasted videogame-themed tabletop role-playing games. 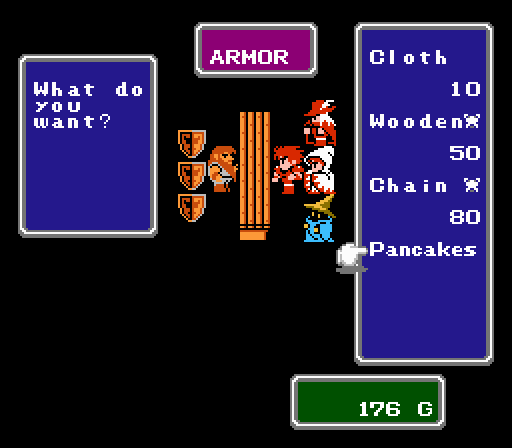 The story and game mechanics of the original NES Final Fantasy were adapted by Nathaniel “Guy Who’s Writing This Post” Hoover to create an adventure so authentic that you’ll swear we really are playing the original NES Final Fantasy, up until the part where the players open their mouths and turn it into a quest for pancakes. Shopping! I swear this is more interesting than it sounds. I gave this a 10 just for “Don’t bring me down, Bruce”. I’m sure the rest of the podcast will be worth it at this rate! Awe yeah, cool ending announcement guy is back! I feel like a kid in the 40’s tuning into his favorite radio show on a Saturday morning. I also don’t think mentally un’stable’ ponies was meant to be a pun, but I laughed anyway. By the way, Wil Wheaton is trying to figure out how to create an RPG fit for his TableTop show. You probably want to see what he’s up to and contact him! The site stripped out my link, but search Google for “Indiegogo Tabletop Season 3 – With Wil Wheaton!” to see what Wil Wheaton’s up to.